Name Index Margaret Christina WADMAN was born on 15 May 1892 in Souris, Kings County, Prince Edward Island. She died on 15 March 1956 at the age of 63 in Gloucester, Essex County, Massachusetts. Parents: Benjamin WADMAN and Flora MACPHEE. Spouse: Wallace Chester WALKER. Margaret Christina WADMAN and Wallace Chester WALKER were married. Children were: Flora Janet WALKER, Wallace Chester WALKER, Margaret WALKER, Daniel WALKER, Herbert Benjamin WALKER. Margaret Elizabeth WADMAN was born on 27 May 1865. She died on 20 February 1950 at the age of 84. She was buried in the St. Marys Roman Catholic Cemetery in Souris. Parents: William Michael WADMAN and Margaret DINN. Spouse: Bernard MCDONALD. Margaret Elizabeth WADMAN and Bernard MCDONALD were married on 13 October 1885. Marion Florence WADMAN was born on 2 February 1916 in Prince Edward Island, Canada. She died on 30 September 1991 at the age of 75 in Prince Edward Island, Canada. She was buried in Milo, Maine. Marion was born and baptized as Mary Ann and later changed her name to make all her legal documents consistent. Parents: William Joseph WADMAN and Mary Teresa MCDONALD. Spouse: Henry D. WILLIAMS. Marion Florence WADMAN and Henry D. WILLIAMS were married on 21 March 1937 in Milo, Maine. Children were: Living, Living. Mary WADMAN was born (date unknown). Parents: Samuel WADMAN and Anna WILSON. Mary Ann WADMAN was born on 9 June 1861. She died on 25 August 1925 at the age of 64. Parents: William Michael WADMAN and Margaret DINN. Spouse: Daniel SMITH. Mary Ann WADMAN and Daniel SMITH were married on 11 October 1885 in Chelsea, Suffolk County, Massachusetts. Mary Ann WADMAN was born on 13 August 1895 in Souris, Kings County, Prince Edward Island. She died on 23 March 1967 at the age of 71 in Halifax, Halifax County, Nova Scotia. She was buried in the St. Gregorys Roman Catholic Church Cemetery in Liverpool. Parents: Benjamin WADMAN and Flora MACPHEE. Spouse: Ladonia Martin "Doane" WHYNOT. Mary Ann WADMAN and Ladonia Martin "Doane" WHYNOT were married on 24 November 1916 in Gloucester, Essex County, Massachusetts. Children were: Hughey Raymond WHYNACHT, James Ladonia WHYNACHT, Mary Louise WHYNACHT. Michael William WADMAN was born on 29 August 1859. Parents: William Michael WADMAN and Margaret DINN. Samuel WADMAN was born (date unknown). Spouse: Anna WILSON. Anna WILSON and Samuel WADMAN were married. Children were: William Arthur WADMAN, Francis Neptune WADMAN, Mary WADMAN. Sarah WADMAN was born on 13 October 1812. Parents: William Arthur WADMAN and Harriet GROSVENOR. Spouse: John WOOD. Sarah WADMAN and John WOOD were married on 31 July 1834. Violet Eileen WADMAN was born on 16 June 1918 in Brownville Junction, Maine. She died on 5 November 2003 at the age of 85 in Dover Foxcroft, Maine. She was buried on 19 November 2003 in the Pine Tree Cemetery in Brownville Junction, Maine. Parents: William Joseph WADMAN and Mary Teresa MCDONALD. Spouse: Lloyd Henry GRAVES. Violet Eileen WADMAN and Lloyd Henry GRAVES were married on 29 November 1936 in Waterville, Maine. Children were: Living, Living. 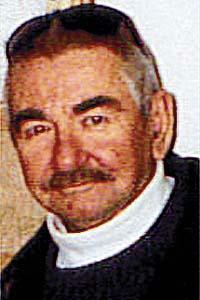 Wayne Reginald WADMAN was born on 10 August 1936 in Brownville Junction, Maine. He died on 1 May 2004 at the age of 67 in Brownville Junction, Maine. He was buried in the Pine Tree Cemetery in Brownville Junction, Maine. Parents: William Joseph WADMAN and Mary Teresa MCDONALD. William Arthur WADMAN was born in 1766 in Exeter, Devon, England. He died on 28 February 1826 at the age of 60. He was buried in the Elm Avenue Cemetery in Charlottetown. Parents: Samuel WADMAN and Anna WILSON. Spouse: Harriet GROSVENOR. Harriet GROSVENOR and William Arthur WADMAN were married on 20 January 1803. Children were: John Cornelius WADMAN, William Michael WADMAN, Benjamin WADMAN, James WADMAN, Elizabeth WADMAN, Sarah WADMAN, Jane WADMAN, George WADMAN, Charles WADMAN, Henry WADMAN, Henry WADMAN, Edward WADMAN. William Claude WADMAN was born on 8 May 1920 in Prince Edward Island, Canada. He died on 21 January 1963 at the age of 42 in Veterans' Hospital, Togus, Maine. He was buried in the Pine Tree Cemetery in Brownville Junction, Maine. Claude was employed by the Canadian Pacific Railway prior to military service and also after military service. He was in the 459th Infantry Anti-aircraft and also the 11th Airborne in the South Pacific. He served in New Guinea and the Philippines mainly. He made 13 combat jumps and was the 9th US man to set foot in Japan as an occupation troop. He served 17 months in the Pacific Theater. He died in 1963 of cancer. Parents: William Joseph WADMAN and Mary Teresa MCDONALD. William Joseph WADMAN was born on 24 July 1887 in Souris, Kings County, Prince Edward Island. He died on 16 March 1968 at the age of 80. He was buried in the Pine Tree Cemetery in Brownville Junction, Maine. Moved to USA when he was 17 years old. "My father died when I was nine or ten. I believe my father had a half brother Mike Wadman. I always remember about hearing that they had no trace of one of my uncles." William lived in South Portland Maine for 5 years where he worked as a carpenter. Most of his life was spent in Brownville Junction, Maine when he worked and retired from the Canadian Pacific R. R. as a locomotive engineer. Parents: Benjamin WADMAN and Flora MACPHEE. Spouse: Mary Teresa MCDONALD. Mary Teresa MCDONALD and William Joseph WADMAN were married on 11 September 1913 in St. Mary's Catholic Church, Prince Edward Island. Children were: Hilda Frances WADMAN, Joseph Benjamin WADMAN, Marion Florence WADMAN, Violet Eileen WADMAN, William Claude WADMAN, Blanche Delverna WADMAN, Honorene Aletha WADMAN, Living, Wayne Reginald WADMAN. William Michael WADMAN was born on 19 March 1805. He died in January 1899 at the age of 93. Parents: William Arthur WADMAN and Harriet GROSVENOR. Spouse: Elizabeth . Elizabeth and William Michael WADMAN were married in 1830. Spouse: Margaret DINN. Margaret DINN and William Michael WADMAN were married in 1854. Children were: Benedict WADMAN, Ann Harriet WADMAN, Benjamin WADMAN, Michael William WADMAN, Isabella Jane WADMAN, Mary Ann WADMAN, William Wallace WADMAN, Margaret Elizabeth WADMAN, Margaret WADMAN. William Wallace WADMAN was born in 1863. He died on 13 September 1918 at the age of 55. Parents: William Michael WADMAN and Margaret DINN. Spouse: Anastasia MCINNIS. Anastasia MCINNIS and William Wallace WADMAN were married. Albert Eugene WAGNER was born on 24 March 1917 in Port Mouton, Queens County, Nova Scotia. He died on 8 March 1987 at the age of 69 in Barbados. He was buried in the Greenwood Cemetery in Port Medway. Parents: William Robie WAGNER and Theresa Sylvia WILLIAMS. Spouse: Hyacinth Norene HILTZ. Hyacinth Norene HILTZ and Albert Eugene WAGNER were married on 21 July 1945 in Port Medway, Queens County, Nova Scotia. Anna Barbara WAGNER was born in 1751. Parents: Johann Heinrich WAGNER and Anna Margareta CONRAD. Spouse: Johann Michael SEILER. Anna Barbara WAGNER and Johann Michael SEILER were married on 25 June 1771 in Lunenburg, Lunenburg County, Nova Scotia. Children were: Johann Heinrich SEILER, Maria Barbara SEILER, Johanna SEILER. Anna Catherine Barbara WAGNER was born on 30 August 1816. She died in 1885 at the age of 69. She was buried in the Dayspring Community Cemetery. Parents: John Henry WAGNER and Anna Maria Magdalena ZWICKER. Spouse: John Michael NAUGLER. Anna Catherine Barbara WAGNER and John Michael NAUGLER were married on 28 November 1833. Anna Maria Margaretha WAGNER was born on 31 December 1726 in Hanau, Hesse, Germany. She died in 1792 at the age of 66 in Northwest, Lunenburg County, Nova Scotia. Parents: Peter WAGNER and Anna Maria Elizabeth GUNGEL. Spouse: Johann Peter CLATTENBURG. Anna Maria Margaretha WAGNER and Johann Peter CLATTENBURG were married on 3 September 1751. Children were: Catherine Margaret CLATTENBURG, Anna Barbara CLATTENBURG, Susanna Elizabeth CLATTENBURG, Johan Peter CLATTENBURG, Johan Jacob CLATTENBURG, Anna Maria CLATTENBURG, Magdalene Salome CLATTENBURG, Anna Barbara Mary CLATTENBURG, Catherine Maria Elizabeth CLATTENBURG. Anna Sophia WAGNER was born on 2 August 1827. She died on 11 March 1901 at the age of 73. She was buried in the Dayspring Community Cemetery. Parents: Rudolph WAGNER and Anna Maria EMMENO. Spouse: John Benjamin SNYDER. Anna Sophia WAGNER and John Benjamin SNYDER were married on 1 February 1849. Children were: John SNYDER, Martha SNYDER. Anne Marie Catherine WAGNER was born on 15 April 1757. She died on 3 February 1826 at the age of 68. Parents: Johann Heinrich WAGNER and Anna Margareta CONRAD. Spouse: Johan Philipp TANNER. Anne Marie Catherine WAGNER and Johan Philipp TANNER were married on 11 November 1777. Children were: Anna Barbara TANNER, Frances Margaret TANNER, Regina Elizabeth TANNER, Mary Magdalena TANNER, Charlotte Elizabeth TANNER, Johan James William TANNER, Catherine Margaretta TANNER, Johan George TANNER, Mary Dorothea TANNER. Annie Augusta WAGNER was born on 25 July 1914 in Riverdale, Digby County, Nova Scotia. She died in September 1982 at the age of 68 in Riverdale, Digby County, Nova Scotia. Spouse: Ernest Romaine Ethelbert HILTZ. Annie Augusta WAGNER and Ernest Romaine Ethelbert HILTZ were married in 1939. Benjamin WAGNER was born on 23 September 1814. He died in September 1852 at the age of 38. Parents: Rudolph WAGNER and Anna Maria EMMENO. Spouse: Anna Maria LANGILLE. Anna Maria LANGILLE and Benjamin WAGNER were married on 7 March 1839. Children were: Julia WAGNER, Minnah Maria WAGNER, Emma WAGNER. Benjamin WAGNER was born on 12 October 1824. Parents: Johan Henry WAGNER and Regina KOLB. Spouse: Maria Anna MCCOOMBS. Maria Anna MCCOOMBS and Benjamin WAGNER were married on 27 May 1845. Children were: Catherine Elizabeth WAGNER, Isabell WAGNER. Bertha Sophia WAGNER was born on 20 January 1904 in Port Mouton, Queens County, Nova Scotia. She died on 16 August 1997 at the age of 93. She was buried in the Peaceful Hill Cemetery in Port Mouton. Parents: James Harvey WAGNER and Lena Marie DEMONE. Spouse: Gordon Sterling FRASER. Bertha Sophia WAGNER and Gordon Sterling FRASER were married on 3 November 1922 in Port Mouton, Queens County, Nova Scotia. Carman Marshall WAGNER was born on 30 September 1886 in West Berlin, Queens County, Nova Scotia. He died in 1972 at the age of 86. Parents: Solomon Abraham WAGNER and Eliza Ann LOHNES. Spouse: Irene Victoria BOUTILIER. Irene Victoria BOUTILIER and Carman Marshall WAGNER were married. Children were: Living. Catherine WAGNER was born in 1833. Parents: Johan Wilhelm WAGNER and Maria Sophia WEINACHT. Spouse: Edward WEINACHT. Catherine WAGNER and Edward WEINACHT were married on 21 November 1850. Children were: Nathaniel WHYNACHT. Catherine Barbara WAGNER was born on 19 October 1777. Parents: Johann Heinrich WAGNER and Anna Barbara BERRINGER. Spouse: Johan Heinrich BECKER. Catherine Barbara WAGNER and Johan Heinrich BECKER were married in 1800. Children were: Sophia Elizabeth BECKER, Catherine Elizabeth BECKER, Mary Catherine BECKER, Louisa BECKER, William Henry BECKER, Dorothy BECKER, George Nelson BECKER, Henry Reuben BECKER. Catherine Elizabeth WAGNER was born on 19 August 1847. She died in 1930 at the age of 83. She was buried in the Ridgewood Cemetery in North Andover, Essex County, Massachusetts. Parents: Benjamin WAGNER and Maria Anna MCCOOMBS. 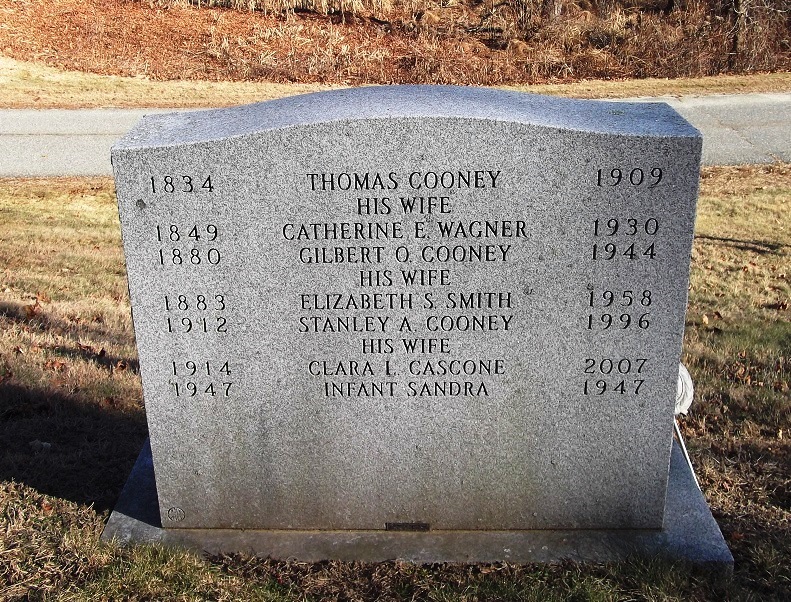 Spouse: Thomas COONEY. Catherine Elizabeth WAGNER and Thomas COONEY were married on 17 December 1868. Cecil Earl WAGNER was born on 1 August 1904. He died on 23 August 1904 at the age of 0. Parents: Harry L. PICKRAM and Winnie Bessie WAGNER. Cecil Osbert WAGNER was born on 2 September 1899 in Queens County, Nova Scotia. He died on 3 October 1985 at the age of 86 in Halifax, Halifax County, Nova Scotia. He was buried in the West Zion United Church Cemetery on Payzant Street in Liverpool. Parents: William James WAGNER and Georgina WOLFE. Spouse: Laura Agnes WOODWORTH. Laura Agnes WOODWORTH and Cecil Osbert WAGNER were married on 24 December 1920 in Liverpool, Queens County, Nova Scotia. Charles Edward WAGNER was born on 2 September 1859 in Black Rocks, Lunenburg County, Nova Scotia. He died on 6 February 1878 at the age of 18 in Port Medway, Queens County, Nova Scotia. Parents: John Simon WAGNER and Maia Ann SCHAUFFELBERG. Charles Leonard WAGNER was born on 31 December 1856 in Black Rocks, Lunenburg County, Nova Scotia. He died in 1897 at the age of 41 in Wylusing, Bradford County, Pennsylvania, USA. Parents: John Simon WAGNER and Maia Ann SCHAUFFELBERG. Charles Owen Adrian WAGNER was born on 31 October 1910 in Port Medway, Queens County, Nova Scotia. He died on 25 July 1980 at the age of 69. He was buried in the Holy Redeemer Anglican Church Cemetery in Port Medway. Parents: Charles Reuben WAGNER and Grace Hazel MCCOOMBS. Spouse: Vivian Clarissa CONRAD. Vivian Clarissa CONRAD and Charles Owen Adrian WAGNER were married on 5 August 1946 in Liverpool, Queens County, Nova Scotia. Charles Reuben WAGNER was born on 10 September 1886 in East Port Medway, Queens County, Nova Scotia. He died on 20 April 1930 at the age of 43 in Port Medway, Queens County, Nova Scotia. He was buried in the Holy Redeemer Anglican Church Cemetery in Port Medway. Parents: John Lewis Simon WAGNER and Clara Eleanor WHYNOT. Spouse: Grace Hazel MCCOOMBS. Grace Hazel MCCOOMBS and Charles Reuben WAGNER were married on 16 December 1909 in Liverpool, Queens County, Nova Scotia. Children were: Charles Owen Adrian WAGNER, William Newman WAGNER, Jennie Arvilla WAGNER. Christopher WAGNER was born on 13 September 1801. Parents: Johan Nicholas WAGNER and Anna FRAIL. Spouse: Elizabeth FRIEDENBERG. Elizabeth FRIEDENBERG and Christopher WAGNER were married on 29 October 1822. Children were: Sophia Isabella WAGNER. Christopher WAGNER was born on 28 September 1808. Parents: Johan Nicholas WAGNER and Anna FRAIL. Spouse: Anna Barbara SPINDLER. Anna Barbara SPINDLER and Christopher WAGNER were married on 16 November 1837. Children were: Elizabeth WAGNER. Christopher WAGNER was born on 24 January 1819 in Port Mouton, Queens County, Nova Scotia. He died on 17 May 1876 at the age of 57 in Liverpool, Queens County, Nova Scotia. Parents: Johan Christopher WAGNER and Hannah Catherine SMITH. Christopher Herring WAGNER was born on 1 March 1816 in West Berlin, Queens County, Nova Scotia. He died on 31 March 1882 at the age of 66 in Port Mouton, Queens County, Nova Scotia. Parents: Johan Henry WAGNER and Regina KOLB. Spouse: Elizabeth MOODY. Elizabeth MOODY and Christopher Herring WAGNER were married on 21 December 1841. Children were: Thomas Henry WAGNER, William James WAGNER, Jacob WAGNER. David WAGNER was born on 22 September 1825. Parents: Philip WAGNER and Elizabeth TILBERT. Spouse: Sarah Matilda VEINOT. Sarah Matilda VEINOT and David WAGNER were married on 3 April 1851 in New Germany, Lunenburg County, Nova Scotia. Children were: Elizabeth WAGNER. David WAGNER was born on 8 March 1846. He died on 25 June 1931 at the age of 85 in Upper Branch, Lunenburg County, Nova Scotia. He was buried in the Midville Branch Cemetery. Parents: Thomas WAGNER and Barbara Eunice ALLEN. Spouse: Marjoire Elizabeth SNYDER. Marjoire Elizabeth SNYDER and David WAGNER were married on 27 December 1867 in Bridgewater, Lunenburg County, Nova Scotia. Children were: Leroy Cephas WAGNER. Dennis Freeman WAGNER was born on 27 May 1881 in New Canada, Lunenburg County, Nova Scotia. He died on 21 March 1971 at the age of 89 in Falkland Ridge, Annapolis County, Nova Scotia. Parents: Jacob Albert WAGNER and Sophia DAREE. Spouse: Frances Maud SILVER. Frances Maud SILVER and Dennis Freeman WAGNER were married. Children were: Marion Lucille WAGNER. Living (private). Parents: Carman Marshall WAGNER and Irene Victoria BOUTILIER. Douglas William WAGNER was born on 31 July 1913 in Port Mouton, Queens County, Nova Scotia. He died on 10 January 1992 at the age of 78. Parents: William Robie WAGNER and Theresa Sylvia WILLIAMS. Elizabeth WAGNER was born on 9 July 1806. Parents: Johan Nicholas WAGNER and Anna FRAIL. Spouse: Jacob FRIEDENBERG. Elizabeth WAGNER and Jacob FRIEDENBERG were married on 29 October 1826. Spouse: Johannes KNICKLE. Elizabeth WAGNER and Johannes KNICKLE were married on 21 May 1837. Children were: Josiah Christopher KNICKLE, John Solomon KNICKLE, John Christopher KNICKLE, Catherine Elizabeth KNICKLE, Catherine Maria Elizabeth KNICKLE. Elizabeth WAGNER was born on 18 April 1808. Parents: Rudolph WAGNER and Anna Maria EMMENO. Spouse: Samuel James Frederick NAUGLER. Elizabeth WAGNER and Samuel James Frederick NAUGLER were married on 1 May 1827. Children were: Samuel James Adolpheus NAUGLER, Daniel NAUGLER, George Solomon NAUGLER, Elizabeth NAUGLER, Alice Mary NAUGLER, John Reuben NAUGLER, Anna Catherine Barbara NAUGLER, Benjamin NAUGLER, Simeon NAUGLER. Elizabeth WAGNER was born on 1 March 1819. She died in 1840 at the age of 21. Parents: John Henry WAGNER and Anna Maria Magdalena ZWICKER. Spouse: Johan Henry WEAGLE. Elizabeth WAGNER and Johan Henry WEAGLE were married. Children were: John Henry WEAGLE. Elizabeth WAGNER was born in 1846 in New Germany, Lunenburg County, Nova Scotia. Parents: David WAGNER and Sarah Matilda VEINOT. Spouse: Mark MARRIETTE. Elizabeth WAGNER and Mark MARRIETTE were married on 11 September 1881 in Sambro, Halifax County, Nova Scotia. Elizabeth WAGNER was born on 25 October 1857 in Dover, Halifax County, Nova Scotia. She died on 27 April 1930 at the age of 72 in East Dover, Halifax County, Nova Scotia. Parents: Christopher WAGNER and Anna Barbara SPINDLER. Spouse: Thomas William ZINCK. Elizabeth WAGNER and Thomas William ZINCK were married on 29 August 1876 in Dover, Halifax County, Nova Scotia. Children were: Charles William ZINCK.